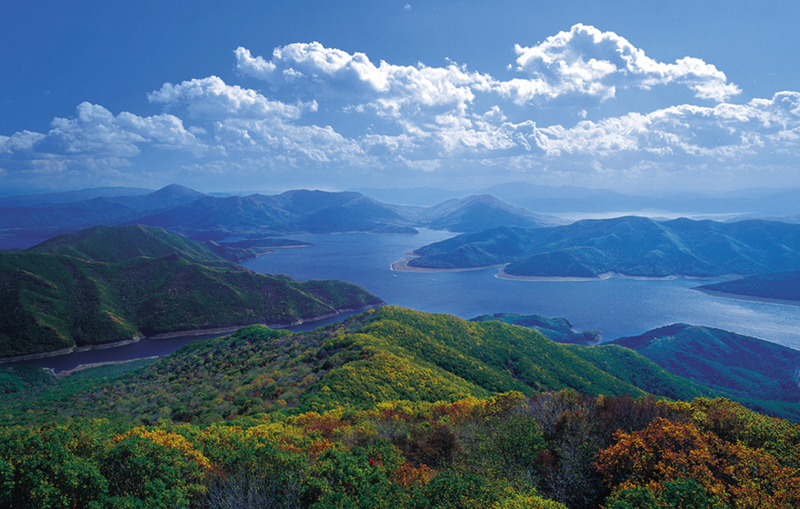 The Songhua Lake Scenic Area, more than 180 km long, is located in the south of Jilin City. It covers an area of 3,620 square km, of which 550 square km is lake area. Its biggest water storage is 10.8 billion cubic meters, which equals four Miyun Reservoir in Beijing. The deepest place is 77.5 meters. It is as beautiful as the Thousand-Island Lake. And it is one of the super-huge artificial lakes in China. There are nine attractions at the Songhua Lake: Wuhu Island, Wolongtan, Fengwuchi, Shilongbi, Hailang Hill, Shuangfeng Mountain, Luotuo Peak, Qingshan Hill and the North Tianmen. The Songhua Lake is considered the top summer holiday destination in China with its cool weather. There are seven recreational facilities including a hanging roller coaster on the Wuhu Island. Another thrilling one is the upper air fly. There are also ones that are good for all people including the elderly and kids, such as double-layer merry-go-round and large beach for swimming. The wild animal park and the Sihanouk Fishing Terrace on the island have been renovated, making the lake a comprehensive entertainment park with restaurants, recreational parks, leisure corridor and rare and precious animals and plants. 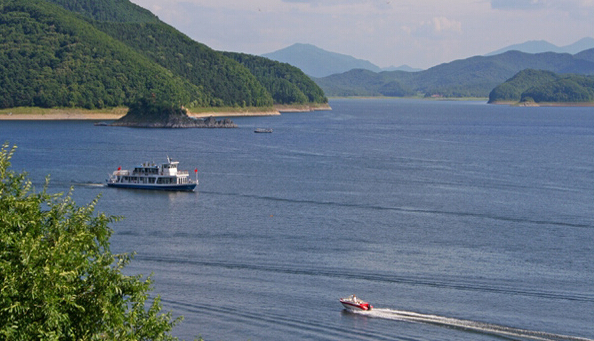 Transportation: The Songhua Lake Scenic Area is about a 40-minute drive from downtown Jilin. Self-driving: Start off from Changchun City on highway, pass by Jiutai City and arrive in Jilin City, which takes about one hour and 20 minutes. Exiting the highway, go along Yueshan Road southward, pass by the overpass of Desheng Road and the North Street to Songjiang Road Middle, go across the Jilin Bridge and through the Jilin Street, Jifeng Road East to the Songhua Lake Scenic Spot. Special tourist bus and public bus: No.33 bus – starting off from Hada House Furnishing in Jilin with an interval of five minutes in between and arrive at the Songhua Lake Scenic Spot directly. It is about 20 km in distance and takes about one hour to arrive.